Take some avocado and mix it with tzatziki and you get this – avocado tzatziki. Cooling. Creamy. Sensual. Tzatziki has always been a constant in my world. Growing up, you can pretty much assume it was always served in my household. And it still is. Sometimes I “throw one together” on the fly to go with a quick weeknight meal. Other times, I take my time to strain the yoghurt for a richer, creamier version of this beloved Greek dip. And other times, I just like to change things around. This avocado tzatziki recipe is not my creation though. I saw the recipe for this on Val’s site over 6 years ago and only made it recently! Time flies when you’re busy experimenting in the blogosphere. As usual I’ve added my own spin on this recipe. 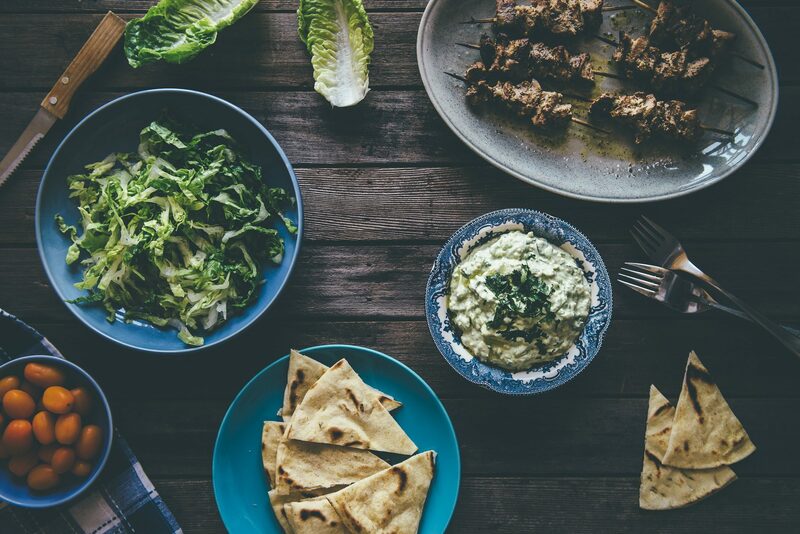 You can pretty much make a traditional tzatziki recipe and add some mashed avocado to it. I’ve gone dowe the “fusion” road today and introduced it to some Mexican guacamole. I swapped some of the traditional herbs and added fresh coriander and lime juice. Next time I’m thinking of adding in some chopped spring onions. It’s hard to explain but the marriage of yoghurt and avocado is a happy one. This would work well with some of my steamed pita bread and pork souvlaki. Take it up another level and serve it up with whatever you fancy.Avocado tzatziki is really that good. A recipe for Greek tzatziki mixed with avocado. It's cooling. Creamy and sensual. Combine all the ingredients above in a bowl and stir to combine evenly. For best results place in the fridge for 3-4 hours prior to serving. Otherwise serve immediately. Adjust the salt to suit your own tastebuds. You could use a lower fat yoghurt but it’s preferable you don’t!